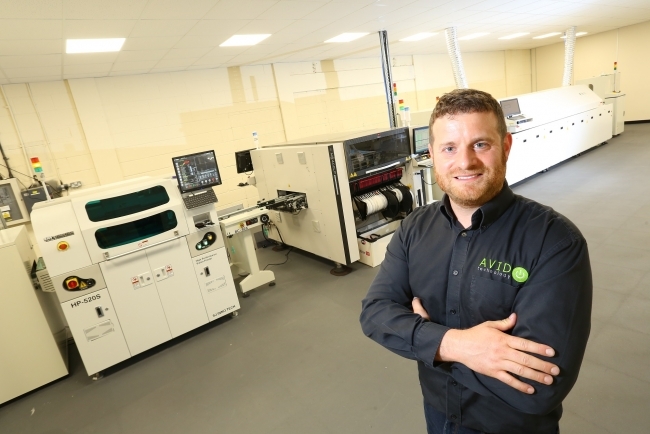 Automotive cleantech firm AVID Technology has invested over £1 million in the expansion of its manufacturing capabilities at its headquarters in North East England. A market leader in the design and manufacture of electrified powertrain systems for the electric and hybrid vehicle industry, AVID’s investment in a state-of-the-art electronics surface mount (SMT) manufacturing facility and new test equipment is set to increase production of automotive electronics and powertrain technology, and enable the company to diversify into the robotics and power generation industries. Ryan Maughan, managing director of AVID Technology Group Ltd, explains: “Our strategy is to increase turnover to £50 million in the next 3-5 years as a specialist supplier of technology for electric vehicles, robotics and industrial electronics by growing our presence in the field of systems electrification. AVID’s new SMT line is designed to meet the rigorous quality demands of the company’s customer base. The facility incorporates a dedicated clean room with full electrostatic discharge (ESD) protection and automatic optical inspection at both the solder print and component placement stages. The high-speed precision technology allows AVID assemble electronic devices in an accurate and repeatable manner for a huge range of applications. AVID’s core expertise is the design of power electronics and motors used in electric and hybrid vehicle powertrain systems, such as pumps, fans and more recently propulsion. The company’s knowledge and pioneering technology is used by manufacturers of heavy duty and high performance electric, hybrid and fuel cell vehicle powertrains for efficient thermal management, lubrication and drive systems. This includes high performance passenger cars manufacturers and motorsport to heavy duty buses, trucks and off highway machinery. AVID’s technology also has many functions in actuation the propulsion of robotics and autonomous systems. “We’ve seen a strong rise in demand for power electronics, motors and controls for non-automotive applications which we are keen to capitalise on by leveraging our skills, assets and brand awareness in the market. “The new investment in our manufacturing facility is backed by our expertise in power electronics, conversion, battery management, and motor control. Our in-house design, manufacture and component testing capability enable us to deliver rapid turnaround and cost-effective solutions for our customers. “There is a great deal of synergy between what we have perfected in the automotive industry that we can bring to new sectors seeking high integrity electronics and motion solutions. This, together with our planned programme of investment and development in people, plant and technology will allow us to grow our presence in the systems electrification industry by providing effective, tried and tested solutions for both new and existing customers throughout the world,” said Ryan. Optimum Technical Solutions Ltd in Manchester supply a wide range of production equipment to the Electronics Industry, they installed a new SE Automation Peak 400 wave soldering machine as part of AVID’s new investment.